My posts about life in Nepal aren’t sugarcoated. I love it here. That said, daily life here does come with its frustrations, and last week I encountered the perfect storm of traditional life and new technology conspiring together to confound me. The situation was this: from some of the expats I met in my area, I had learned about a free yoga class offered at someone’s home on Sunday, Tuesday, and Thursday evenings. It seemed like a great way to meet people and practice ashtanga yoga, which I had not yet found here among the various yoga offerings. My friend had agreed to meet me at a designated landmark, Jazzabell Cafe, from where we would walk to class together. Sounds simple, right? Well, not so in Nepal. Problem 2: Locating Jazzabell Cafe. 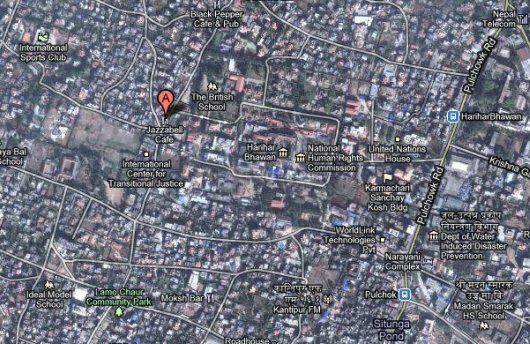 As you will note on the map, there are few street names — this is not the fault of Google mappers but the tradition of Nepal. With the exception of major roads, there are no street names. My address, for instance, is just “Prajani Villa,” the name of my house — sure, it sounds chic, but a street name would really help me out. Anyway, not being familiar with the streets around Jazzabell Cafe, I mapped out what appeared to be the most direct route: from Pulchowck Road, I took a left at the UN House and continued left at the National Human Rights Commission. But instead of eventually arriving at the restaurant, I landed in a complex of Department of Agriculture buildings — dead end. Problem 3: Connecting over the cell phone network. At this point my watch read 5:50 p.m., so I knew I was cutting it close to make it to the class on time. Half-running, half-walking back in the direction of Pulchowk Road, I tried calling my friend for directions to Jazzabell. Unfortunately for me, my call did not go through because, as I am learning, the cell phone network here is unreliable. It is not uncommon to hear a message that the phone is out of service and then, one minute later with a second call, manage to connect. This time, though, there was no redemption with a second call. Or third or fourth call, for that matter. Eventually, my friend called me, and we agreed to give it a try on another evening. As I headed home, with my yoga mat reminding me with every bump against my side of this Google Map and Cell Phone Fail, I started out feeling extremely frustrated and stuck on the idea that this situation would never happen in the U.S. Then I realized, though, that this position was somewhat unfair because 1) I have gotten lost in the U.S. plenty of times too (mostly when driving around Boston with my mother, but that is beside the point), and 2) in the U.S. I never had the opportunity to attend a free yoga class at someone’s house with people I had just met. So far, the opportunities for trying new things and stepping outside my typical routine have far outweighed the few frustrations that have come along the way. I hope this balance stays true. In the meantime, I’m going back on Tuesday for Round 2: Find that Yoga Class. I will probably give myself a good hour and a half to get there. What if you would try to be guided by your inner senses and intuition to get there? might be helpful for other times and other situations too?